I have been reading lots of thrillers recently so decided to change things up and try a different genre. 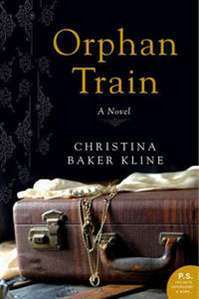 Orphan Train by Christina Baker Kline is an epic story of an rich elderly Irish emigrant and a troubled teenage girl, an unlikely pair brought together by circumstance, only to find their life stories have alot in common. Christina Baker Train is an unforgettable story of friendship and second chances that highlights a little-known but historically significant movement in America’s past—and it includes a special PS section for book clubs featuring insights, interviews, and more. As she helps Vivian sort through her possessions and memories, Molly learns that she and Vivian aren’t as different as they seem to be. A young Irish immigrant orphaned in New York City, Vivian was put on a train to the Midwest with hundreds of other children whose destinies would be determined by luck and chance. Molly discovers that she has the power to help Vivian find answers to mysteries that have haunted her for her entire life answers that will ultimately free them both. Rich in detail and epic in scope,Orphan Train is a powerful novel of upheaval and resilience, of unexpected friendship, and of the secrets we carry that keep us from finding out who we are. I was genuinely disappointed when this book ended and wanted it to go on because i was so caught up in the story and their lives. I was intrigued by the novel that i went on to research the Orphan Train phenomenon after i had finished the book. The Orphan Train Movement was a supervised welfare programme that transported orphaned, homeless and abandoned children from crowded Eastern cities of the United States to foster homes located largely in rural areas of the Midwest. The orphan trains operated between 1853 and 1929, relocating about 250,000 orphaned, abandoned, or homeless children. The children were brought by train to many in rural areas in the Midwest and were lined up at train stations in the hopes that a local family would give them a home in return for manual labour on farms or as domestic help. This is probably one of the best historical fiction novels i have read since The Girl with the pearl earring. If you are interested in this genre or indeed interested in the plight of Irish Emmigrants to the US in the last century then i can happily recommend this book. I give this novel a solid 4 star Dublin Mummy rating. Have you read it? Did you love or loathe it? Let me know in the comments. Loved this book. Was on the list of my favorite books of 2014 (blog post).